January 1972. Across the world, the past 12 months have been marked by violent political upheaval, from coups in Africa and South America, to rebellion in Sri Lanka, and, closer to home, worsening violence in Northern Ireland and bomb attacks by a radical left-wing group called the Angry Brigade. At the start of its ninth season, Doctor Who tacitly acknowledges these events in a story which features a group of rebels with whom the Doctor sympathises, but cannot condone, and a moral which clearly states that the end does not justify the means; that violence only results in more violence, and no-one wins. The first episode begins with a crisis: World War Three looms, and this time the end of the world isn’t going to be at the hands of alien invaders, but human beings. Even UNIT is struggling to keep up with the worsening situation, and while the Doctor hides away in his laboratory, tinkering with the TARDIS, the Brigadier has been placed in charge of security at a last-ditch international peace conference whose chair, Sir Reginald Styles, is apparently being haunted by ghosts. Day of the Daleks is a pretty radical change from the stories of Season Eight. For a start, the glittery, glam sensibility of Terror of the Autons and The Claws of Axos is barely in evidence – despite the shiny-faced Controller and the gold Supreme Dalek. If anything, this feels like a throwback to the grim tone of Season Seven. The comfortable villainy of the Master is no more. Instead, we get time travelling human guerrillas and futuristic ape-men from a post-apocalyptic dystopia, like something out of a Planet of the Apes film (indeed, 1971’s Escape from the Planet of the Apes involved gorillas travelling back in time from a devastated Earth). In short, this is all suddenly much more serious and grown up than last year’s episodes. Perhaps as a result, the Doctor spends much of the story on the back foot – bound and gagged, beaten and tortured, and finally, prone and mentally assaulted. We haven’t seen our leading man in this bad a way since he was interrogated on the parallel Earth – and just like in Inferno, the Doctor is once again cast in the role of Cassandra, struggling to convince the 22nd Century rebels that they’re condemning the Earth through their own actions. Until the end of the second episode, the audience is ahead of the Doctor, who is unaware that his greatest enemies are at the heart of what’s gone wrong with the future. Because the most important thing about this story is that the Daleks are back after a five-year absence. It’s well known that Louis Marks didn’t originally intend this to be a Dalek story, and some have even gone as far as to say their inclusion is pointless. While it’s true that the production team can’t quite remember how to do them – the voices are off, and the director doesn’t shoot them from the most interesting angles – to suggest that this would be better off as an Ogron only story is odd. After all, if you could tell an alternative history story where Hitler won World War Two, why would you pick Mussolini? No, the Daleks are absolutely the right villains for this story, because they bring such a weight to the broken future. And although the production team don’t quite get the details right, they nail the tone – slave labour camps, a subjugated Earth, the manipulation of time. Even people who never saw a Dalek story before might be expected to have picked up that this was the kind of thing the Daleks did all the time in the 1960s. The other reason why the Daleks are the right choice is because without them, this would only be the joint biggest danger the third Doctor has ever faced. After all, he already glimpsed an apocalyptic Earth in Inferno. The presence of the Daleks makes this unquestionably his most dangerous adventure yet. Because they haven’t just travelled back in time, changing history and conquering the Earth, but they’re also planning on taking over the universe. And while we can never quite believe that the dear old Master would ever actually succeed, the Daleks are another matter entirely. Before Day of the Daleks, the third Doctor has never had an adventure on the scale of his predecessors. Yes, he’s foiled invasions of Earth and megalomaniac plots. But he’s never had to battle an enemy that has already conquered the planet, or that will pursue him through time to his death. Two years into his era, you’d be forgiven for having a niggling sense that the Doctor isn’t quite as good as he used to be; that when the Time Lords exiled him to Earth, they diminished him. Even the Daleks – who knew the second Doctor the instant they set eyes on him – don’t recognise this new version. Who can blame them? If you hadn’t seen the show since The Evil of the Daleks and you switched on to see radio comedian Jon Pertwee working for the British Army, you might be wondering what on earth has happened to the magic of Doctor Who. But then the Daleks discover, to their obvious terror, that this is the same man that defeated their first invasion of Earth; who turned their Time Destructor on them, and brought about their apocalyptic civil war. He is absolutely the same man. And he isn’t diminished. If anything, he’s grown in stature. The way the third Doctor defeats the Daleks is unique. He doesn’t trick them, or lash up a gizmo, or turn their weapons against them. He appeals to the one thing in their last story they admitted they could never overcome – the human spirit. He stops the guerrillas from killing the Controller. That act of mercy, a word the Daleks don’t understand, is the salvation of the entire planet. 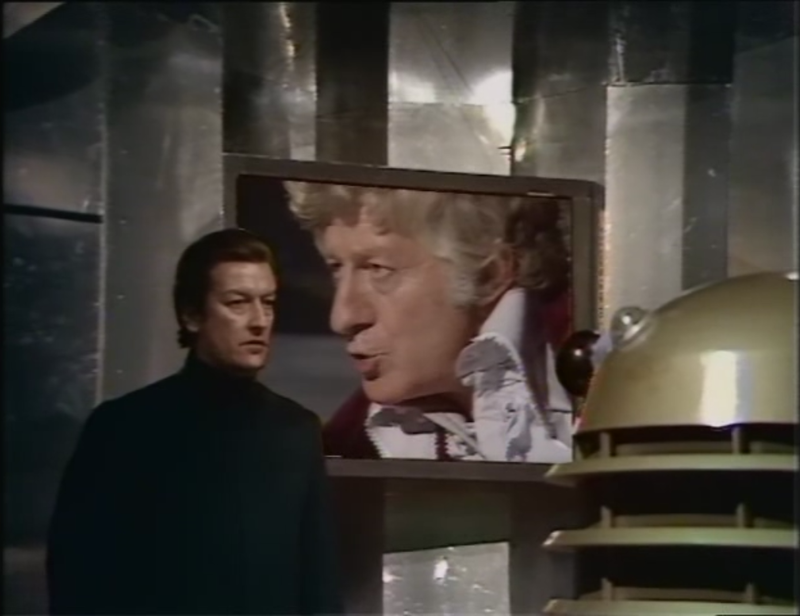 The third Doctor doesn’t just defeat these Daleks, he stops them from even existing. A Doctor who’s been trapped on a devastated Earth, without his TARDIS and without the Brigadier, with no weapons and no plan. And he wins his most complete victory over his greatest enemies. No wonder they’re terrified of him. No wonder the past Doctors turn up to gaze benevolently down on their anointed successor, finally proving himself a more than worthy replacement. Day of the Daleks is a fantastic story. It’s one of Pertwee’s best-ever performances. After a year when they were writing for a generic ditzy female assistant, the writers have now had chance to see what Katy Manning is capable of, and she gets to be resourceful, brave, and one of the all-time great companions. The script manages to make a potentially complicated idea easy to follow thanks to clever segueing between scenes and time zones. Most importantly, once and for all, it shows that this Doctor doesn’t need UNIT. And that’s surely got to be a deliberate choice by the production team. Last year, Colony in Space (deliberately the only past story referenced in this episode) showed that they could still do Doctor Who like it was made in the 1960s. This feels like a definitive step forward. Although UNIT appear, they’re sidelined: absent from the future Earth episodes, and barely interacting with the Doctor and Jo. Then they don’t even appear in the next three stories and when they do finally turn up again in The Time Monster they’re only useful for delivering the Doctor his TARDIS so he can go and have an adventure in history. Though they’ll appear in five more Pertwee stories, only two of those could really be compared to their Season Seven and Eight heydays. So, The Three Doctors is merely a tidying up exercise: it’s here that the line is really drawn under the trapped on Earth saga. With the Daleks back and the TARDIS more or less working, all the pieces are in place for the Doctor to resume his adventures in space and time. He’s back, and it’s about time. Next Time: “Everything that ever hated you is coming here tonight. You can’t win this. You can’t even fight it…” A war is brewing on the Frontier in Space.